Alan Garcia Alvarez is currently 5-0 using a Nimble Mermail Deck featuring 3 copies of Sekka’s Light. Now he’s Dueling against Arturo Odilon Nava Casas and his Mekk-Knight Invoked Deck in this Round 6 Feature Match! Neither of these 2 Decks has become mainstream in the present Advanced Format, but both of them are powerful and explosive Decks that have proven their ability to compete with other popular Decks in the field. 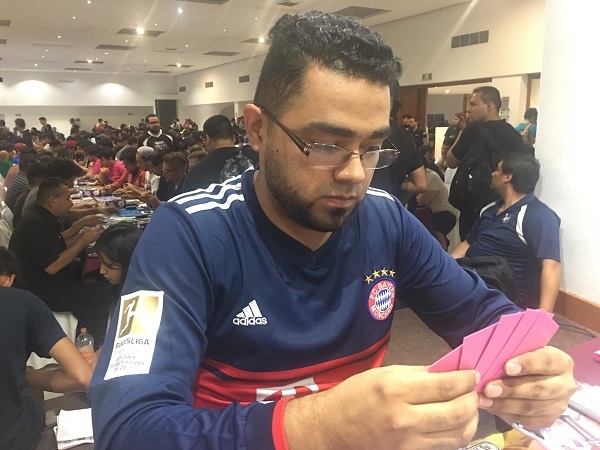 It’s time for these two undefeated Duelists from Mexico to Duel! Nava started off Duel 1 by Summoning Aleister, the Invoker and using its effect to add Invocation to his hand. He activated Invocation, banishing Aleister and sending his in-hand Mekk-Knight Indigo Eclipse to the Graveyard to Fusion Summon Invoked Mechaba. Next he shuffled Invocation from his Graveyard back into his Deck and returned his banished Aleister to his hand. Garcia opened up with Genex Undine, Genex Controller, Neptabyss, the Atlantean Prince, Swap Frog, and Ronintoadin. He drew D.D. Crow for his turn and then Normal Summoned Neptabyss. He used its effect, sending Atlantean Dragoons to his Graveyard and adding a Dragoons to his hand. He then used the effect of his Dragoons to add Mermail Abyssmegalo to his hand. He tried to Special Summon Abyssmegalo by discarding Ronintoadin and Dragoons from his hand, but Nava activated the effect of Mechaba by discarding a monster from his hand. Garcia added Moulinglacia the Elemental Lord to his hand with the effect of his Dragoons and then discarded Genex Undine to Special Summon Swap Frog. He sent Swap Frog from his Deck to his Graveyard with the effect of the Swap Frog he had just Summoned, putting a total of 5 WATER monsters in his Graveyard. He Special Summoned Moulinglacia and activated its effect, forcing Nava to discard Aleister, the Invoker and Mind Control from his hand. 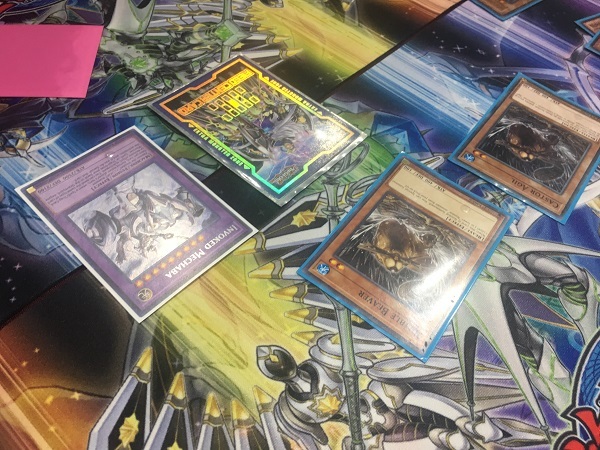 Next, he banished Swap Frog from his Graveyard to Special Summon Ronintoadin and combined it with the Swap Frog on his field to Summon Toadally Awesome! He attacked Mechaba with Moulinglacia to destroy it and then attacked directly with Neptabyss and Toadally Awesome, dropping Nava down to 4700 Life Points. Nava drew a card and conceded, completely overwhelmed by Garcia’s start. 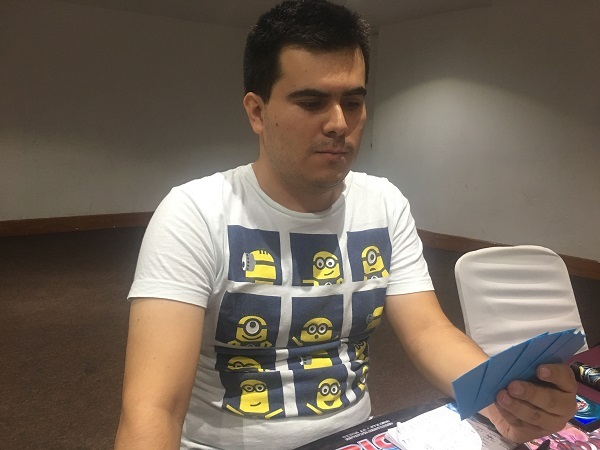 Alan Garcia Alvarez wins the first Duel with Mermails thanks to Moulinglacia, the Elemental Lord! Nava Summoned Aleister, the Invoker and activated its effect, but lost out to Ash Blossom & Joyous Spring. He activated Invocation next, banishing Aleister from his field and sending Mekk-Knight Blue Sky from his hand to his Graveyard to Special Summon Invoked Mechaba to his Extra Monster Zone. Next, he shuffled Invocation back into his Deck to add his banished Aleister to his hand. Garcia drew a card and then had Nimble Angler, Nimble Sunfish, D.D. Crow, Exodius the Ultimate Forbidden Lord, and Deep Sea Diva in his hand. He Summoned the Diva and activated its effect, but lost out to the effect of Mechaba when Nava discarded Aleister. Garcia Summoned Exodius next, shuffling all monsters in his Graveyard back into his Deck. He attacked with Exodius, sending Nimble Angler from his Deck to his Graveyard, and then used the effect of Nimble Angler to Special Summon Nimble Sunfish and Nimble Beaver from his Deck. Exodius’s attack continued, causing it to be destroyed by Mechaba and banished from the Duel. Next, Nimble Sunfish attacked into Mechaba, dropping Garcia’s Life Points down to 4000, and Garcia sent an Angler from his Deck to his Graveyard. Unfortunately for Garcia, his other Sunfish was in his hand. He used the Angler’s effect to Special Summon a Beaver, and then realizing that his little Nimble monsters weren’t getting him anywhere, he conceded. The Match is moving on to a third and final Duel! 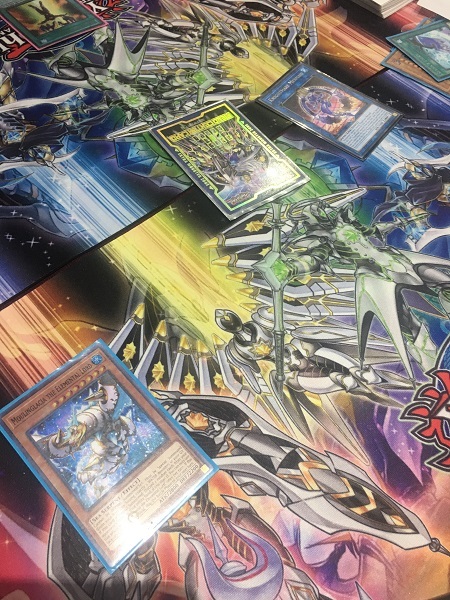 Garcia opened up Duel 3 with Mermail Abyssmegalo, Genex Undine, Sekka’s Light, and 2 copies of Atlantean Dragoons. He Summoned Genex Undine, sending Nimble Angler from his Deck to his Graveyard to add Genex Controller from his Deck to his hand. He then activated the effect of Nimble Angler, and lost out to Ash Blossom & Joyous Spring. 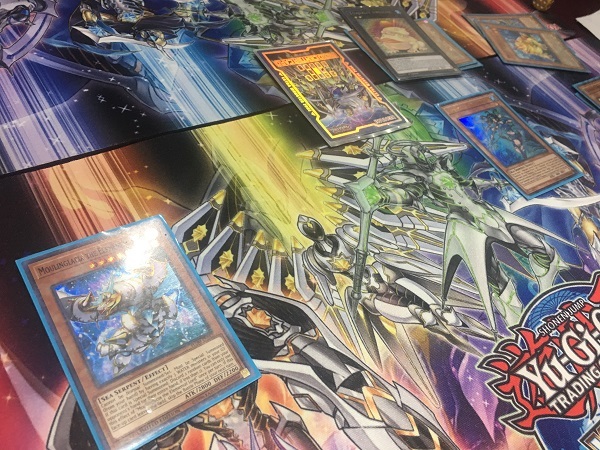 Next, Garcia discarded 2 copies of Atlantean Dragoons to Special Summon Mermail Abyssmegalo, and used the effects of his 2 copies of Dragoons to add Neptabyss and Moulinglacia to his hand. He activated Sekka’s Light next, drawing D.D. Crow and another copy of Sekka’s Light from his Deck. He banished Sekka’s Light from his Graveyard to shuffle Genex Controller from his hand back into his Deck and draw his third Sekka’s Light. He then combined Genex Undine and Abyssmegalo to Link Summon Mistar Boy, putting 5 WATER monsters in his Graveyard. He Special Summoned Moulinglacia next, discarding Invocation and Terraforming from Nava’s hand. Nava drew a card and then had 3 cards in his hand. He Set a card to his back row across from Mistar Boy and then Special Summoned Mekk-Knight Yellow Star in the column. He activated Mind Control to take control of Mistar Boy next, and combined Yellow Star with Mistar Boy to Link Summon Topologic Trisbaena. Garcia Summoned Neptabyss and used its effect to send Atlantean Heavy Infantry from his Deck to his Graveyard and add Dragoons from his Deck to his hand. He used the effect of Atlantean Heavy Infantry to destroy Trisbaena and then activated Sekka’s Light to draw 2 more cards. He Special Summoned Exodius next, shuffling all monsters in his Graveyard back into his Deck. Then, he attacked directly with Exodius, and Nava activated Forbidden Chalice to negate its effect and give it 400 ATK. Moulinglacia and Neptabyss attacked directly next, dropping Nava down to 4000 Life Points. In Main Phase 2, Garcia used Neptabyss and Exodius to Link Summon Knightmare Phoenix, and then used Knightmare Phoenix to Link Summon Knightmare Mermaid. He banished Sekka’s Light from his Graveyard to shuffle D.D. Crow from his hand into his Deck and draw Genex Undine before passing his turn. Nava drew Mind Control. With no other cards on his field or in his hand, he conceded. Alan Garcia Alvarez wins the Round 6 Feature Match to advance 6-0 with his Nimble Mermail Deck!